First part of the Laya Gasa Trek goes along the same route as the Jomolari Trek I right till Lingshi. Unforgettable views of Mount Jomolhari, Jichu Drake, Gangchhenta (Great Tiger Mountain) and other peaks. Opportunities to spot blue sheep and even takin. See Bhutanese mountain villages, the unique culture and appearance of the Layaps (people of Laya district) and finally a day of relaxation at the Gasa hot springs. You can take the trek today easy as it is the shortest walking day. Shortly after starting you will reach a chorten below Lingshi Dzong. Here, you have the choice of staying on the main trail or taking a diversion up to the Lingshi Dzong (4,220m), which sits right atop a ridge. Besides a very special atmosphere of mystic silence Lingshi Dzong provides a great view over the valley. After Lingshi Dzong you will be passing the villages of Lingshi and Goyul. 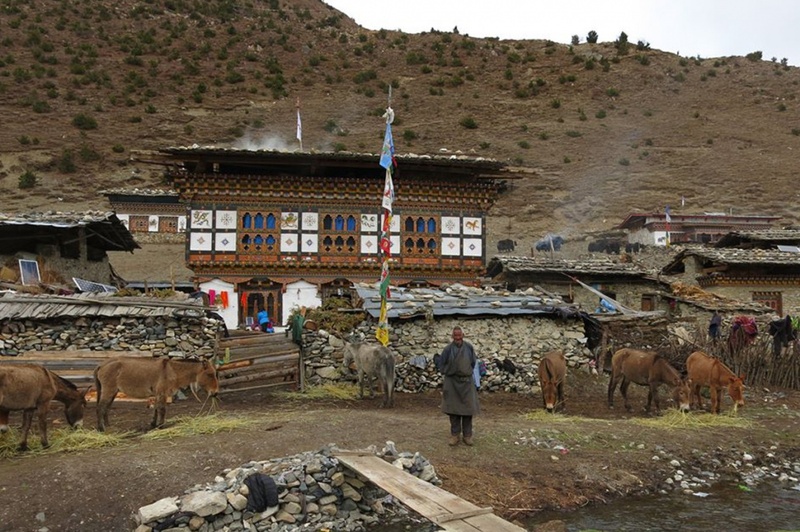 In Goyul, the stone houses are clustered together to a small compact village that is unusual in Bhutan where village houses are normally scattered. On reaching the campsite at Chebisa with a beautiful waterfall behind the village, you will have plenty of time to visit the village houses if you feel up to it. As the walk is a little strenuous, it is advisable to start early. You climb up the valley to view Kang Bum (6,526 m) and some edelweiss. After two hours of climbing you will reach Jhari La (4,750m), from where you catch the first sight of Sinche La, the pass you will have to cross the day after. The big snow peak in the north is Gangchhenta 6,840 m, better known as the Great Tiger Mountain. If weather is clear, Tserim Kang and the top of Jumolhari will be visible. The camp by the river is called Tsheri Jathang. Herds of takin, the Bhutanese National Animal, migrate to this valley in summer and remain for about four months. The valley has been declared a takin sanctuary. Climb up a little bit and you will reach the campsite at Robluthang in a rocky meadow. Today you will have your last major climb of the Laya Gasa Trek. You will cross the Bari La (3,740m), after which the trail is all the way down till you reach Gasa village (2,770m), where you will find the first restaurants since starting from Drukgyel Dzong. There also is a campsite close to Gasa Dzong ( You will have to decide if you want to stay in Gasa village or descend for another one hourto the Gasa Tsachu (hot springs) and relax in the thermal water. The Gasa Tsachu is one of the most popular hot springs in Bhutan. Day 13: Gasa – Damji (Distance 18km, five to six hours, 480m ascent, 470m descent, camp altitude 2,250m). After a short climb, the trail winds through lots of ups and downs, through rolling hills and passes and pine and oak forests, villages and wheat fields. You will also see a beautiful view of the Gasa Dzong glued to the valley wall as if floating in space. You finally reach Damji with its well maintained campsite. Day14: Damji – Tashithang (Distance 16km, five hours, 250m ascent, 870m descent). The trail descends from the high agricultural benches above the Mo Chhu into a lush semi-tropical gorge filled with banana trees, creepers and various tropical vegetation. You will also see monkeys and a few other animals occasionally. The road actually leads further up than Tashithang and will soon reach Damji. You can save about two hours of walking when you arrange transport from the current roadhead.